As anyone who knows me knows – I never finish anything. Ok, well, not ENTIRELY true. I finished a hat in 2007, and a hat last year for my hubby. 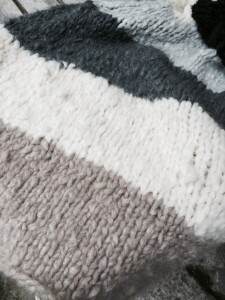 A long, long time ago, I made a blanket. In all truth, I basically spend my life knitting swatches. So, to celebrate our newest product addition, I decided to knit a really, really, really big swatch – and call it a blanket. Why did I do this – simply, because of the yarn. We just received Jade’s incredible new line of italian cashmeres. This one, called OOH, is a super fluffy, almost angora like italian cashmere that is, well, let’s just say they named it ALMOST perfectly – I would have called it OMG. Lapland – 6 skeins, stockinette – gets you a 25 x 40 (approx) lap blanket or wrap. Wear it how you will. Lapland as I’ve done it here, uses 1 of each color in the OOH series. A total of six balls, from pure white to black. knit stockinette (knit first row, purl second row, repeat) until you get very close to finishing the skein. Tie on the next ball/color. Repeat until you are done with all six balls. 6 Balls on a size US17 needle well get you a 25x 26-40 blanket, depending upon on how tightly you knit it. Use a smaller needle for a slightly denser gauge, and a denser blanket. Use a 17 as I did here for a light as a cloud blanket which could also be worn as a shawl. Why is this not totally boring? Well, aside from the tactile fulfillment, which is spectacular, this is FAAAAST. 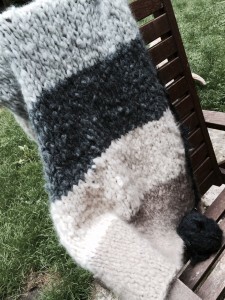 This yarn knits up at approx /2.5 stitches to the inch – so you can gauge your final dimensions according to that. I will say however, that unlike most projects, besides the urge to finish it and PUT IT ON – you will NOT want to stop knitting with this. This yarn knits up so fast – it’ll be over before you know it – our favorite type of project! It is dear – this 6 skein project will set you back 256$ AFTER our discounts. You won’t mind. Truly. 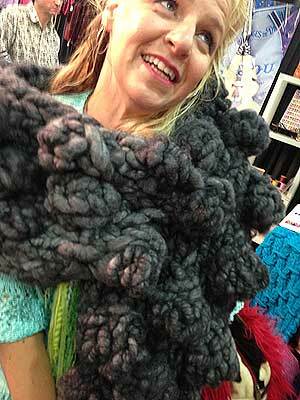 If you don’t want to jump in with that – buy 3 and knit the Neckstacy cowl that is a free download with your purchase. Now, I’m hoping I can convince Heather Dixon to create a massively beautiful roll neck sweater in this fiber. I can’t imagine ever taking it off.